Europium belongs to the Lanthanides family, it has chemical symbol Eu and atomic number 63. It is silvery-white solid at normal pressure and temperature, but it easily oxidizes to the air! Europium is a very reactive metal, which actually has a silvery color, but oxidizes quickly in air. It is toxic and is the most ignoble of the lanthanoids after lanthanum. It has its most important application as red and blue luminescent substance, e.g in CRT television sets. The phenomenon fluorescence was named after fluorites with Eu2+ inclusores. We supply this element at the purity of 99,95% in a 5 mL glass vial with about 1,5 cm of diameter available in 1 day when in stock, or 99,99% of distilled Eu in argon sealed ampoule available in 2-3 weeks. Pure and Rare Europium metal powder 1 gram 99,99% in glass vial. Pure Europium element 63 sample. 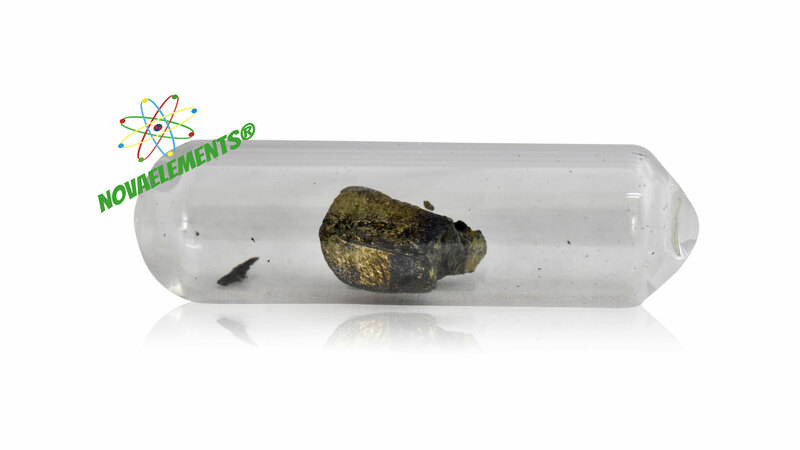 Pure and Rare Europium metal sample element 1 gram 99,99% in glass vial under mineral oil. Pure Europium element 63 sample. NEW DELIVERY.